A fire at Ocado's flagship robotic distribution centre will hit sales growth, the British online supermarket pioneer said today, sending its shares sharply lower. Around 20 fire engines and 200 firefighters were called to the highly automated site in Andover, southern England, early on Tuesday morning to tackle a blaze that raged for over 24 hours. "Whilst we are informed by the Fire Brigade that it is now under control, during the night part of the roof collapsed and there has been substantial damage to the majority of the building and its contents," Ocado said. 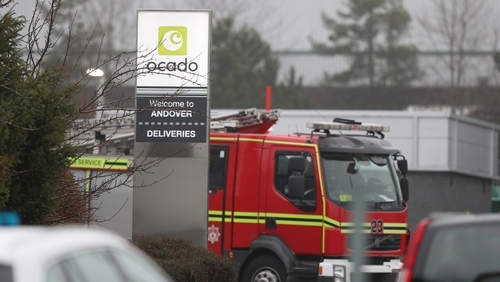 The Andover site was providing about 10% of Ocado's capacity. "As a result of this incident there will be a constraint on our ability to meet our growing customer demand and there will be a reduction in sales growth until we can increase capacity elsewhere," it said. Ocado said it had insurance cover for the property, stock and equipment on site, and for business interruption losses. The Andover plant, which can process 65,000 orders a week, is Ocado's third automated warehouse. It has been instrumental in the firm winning four major deals to sell its technology to international retailers such as US group Kroger and France's Casino. While Ocado's first two centres required workers to load thousands of crates traveling on miles of conveyor belts, Andover has hundreds of robots speeding along at four metres per second on giant grids. Ocado said the fire had broken out on one of the grids of robots, forcing it to suspend operations. Its shares were down 8% in London trade this morning. The group's £7 billion market valuation is linked to its future as a technology provider to international retailers needing to roll out online delivery services to compete with tech giants such as Amazon. In Britain it has a 1% share of the grocery market. The company yesterday reported full-year earnings and cautioned that investment in partnership deals would hit short-term profits.